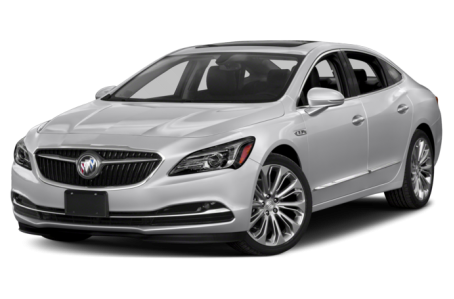 The 2019 Buick LaCrosse is a full-size premium sedan that competes with the Lincoln Continental, Chrysler 300, and Volvo S90. Powering the LaCrosse is a standard 194-hp, 2.5-liter four-cylinder engine mated to a six-speed automatic transmission. Also available is the 310-hp, 3.6-liter V-6 engine mated to a nine-speed automatic. Front-wheel drive comes standard, while all-wheel drive is available. Six trims are available: the base model, Preferred, Essence, Sport Touring, Premium, and Avenir. The high-end Avenir comes with a unique front grille, wood-tone interior trim, and a panoramic moonroof.